The Spectrafuge 16M is the perfect , high speed. compact microcentrifuge. Producing a maximum of 16 000 x g, it is the ideal unit for DNA applications. 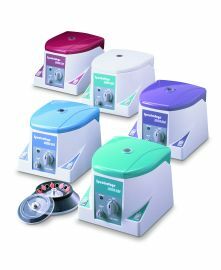 A brushless, maintenance free motor provides extremely fast acceleration and deceleration of the 18-place rotor and makes the Spectrafuge 16M the quietest microcentrifuge in its class. Speed and time are set with the control knobs on the front panel of the unit. A "quick" button allows for momentary runs. A continous flow of ambient air through the rotor chamber keeps the rotor and samples cool. For applications requiring sub-ambient temperatures, the Spectrafuge 16M may be operated in a cold room. TheSpectrafuge 16M is supplied complete with an 18 place rotor for 1.5/2.0 ml tubes. Smaller tubes are accomodated by adapters (sold separately). The optional StripSpin rotor adapter holds two 8 x 0.2 ml strips, typically used for thermal cycling.